Generating electricity from falling water provides a reliable source of renewable energy, but it isn’t an option for everyone, as not many people have a river running through their garden. However, as a community renewable resource, most villages and towns are near running water, but you still need to have access rights to it. Not all water courses are suitable, though, as there needs to be enough water year-round, and the water needs to pass through a certain gradient. Furthermore, it can be quite expensive to install a hydro (water power) system. Having said that, it is also very traditional, and there are still many disused mills around the country that are waiting for Heritage Lottery Funding or similar to be reinvigorated! Flour mills powered by water were numerous even when the Doomsday book was compiled and water power was the primary power source for this country’s Industrial Revolution. Most of the best hydropower sites in England were identified by our ancestors and wherever there was a good flow and drop of water, they built a mill. There are estimated to be around 40,000 such sites in England. The type and size of suitable turbine are determined by two main things. The flow of the water (the speed at which it flows and volume), and the fall of the water – the distance between its highest point and lowest point, also known as the head. If there is a high fall, then the flow can be low and vice versa. The higher the flow and the higher the fall, the more energy can be generated. A proportion of the river flow is diverted through a rotating turbine that connects to an electricity generator via a belt, a chain or gears. The greater the head (also known as the drop – the height of the slope of the river bed in a particular stretch of river) and flow, the more electricity is generated. Head is cheaper to make use of than flow and if the head is below 900 mm then hydropower is not viable. 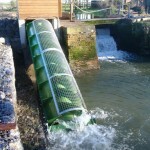 Fish are prevented from entering the turbine by a fine screen with a low water velocity in front of the screen enabling fish to escape the pull of water towards the screen. The turbine can be located at the site previously occupied by a water wheel, or, if the wheel is still in place, to the side of the wheel. Another option is location adjacent a weir. The amount of water allowed through the turbine must be agreed with the Environment Agency and is controlled with a level sensor that gradually closes down the turbine as the up river water level drops. For High head sites above 35 m Pelton or Turgo turbines are chosen. A jet of water at high pressure from a pipe is delivered to a Pelton wheel, which has a series of cups or buckets at the rim to take the impact. The wheel spins at high speeds, ideal for electricity generation. A Turgo turbine is similar in function, the difference being that the water jet can be directed to curved blades on the rim from the side of the wheel. The turbine housing is shaped like a snails shell, which curls the water around the turbine at right angles to the shaft entering it from all directions through guide vanes onto curved blades. The water leaves flowing parallel to the shaft through a draft tube. They are typically located in the empty wheel pit and powered the original milling machinery. In some cases, in the first part of the twentieth century, they were connected to an electrical generator. It was almost as expensive to manufacture small Francis turbines as it was for larger models so few small Francis turbines were ever made. Their large size is well suited to high flow moderate head sites. The design is simple but efficient, and a cost effective solution for the relatively low head sites. The turbine resembles a drum with a series of thin slightly curved blades arranged parallel to the turbine shaft. The water is directed onto the top of the rotating drum where most of the energy is absorbed. It then flows through the hollow core and passes through the blades a second time allowing more energy to be absorbed. The turbine can be built in sections, usually 2/3 and 1/3 so that part of it can be blocked off during times of low flow when other turbines would have shut down completely because their efficiency is so decreased. A propeller turbine looks just like a ships propeller with blades fixed to a shaft while a Kaplan turbine has blades that can be twisted around slightly – varying the pitch – to maximise the energy extraction for a particular flow rate. Propeller turbines are relatively cheap and easy to cast, even when quite large but need high flows to be worthwhile. This makes them well suited to the low head high flow conditions of the mid to lower Stour. The turbine is housed in a simple open-ended tube. A variable pitch Kaplan turbine will obviously be more expensive than a simple propeller turbine. This adaptation of a propeller turbine has been developed by Derwent Hydro to overcome some of the high costs of the civil engineering often involved in developing a hydropower site. 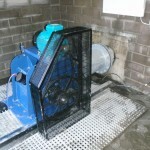 A suction pump primes the 4 bladed propeller turbine by drawing water from upstream through a rectangular intake to the turbine – which is located above flood water levels – until it flows through the turbine. A conical shaped draft tube discharges the flow downstream. No intake gate is required to shut off the flow as opening of a valve breaks the siphon. These are very large, highly visible, robust structures and similar in this respect to water wheels. 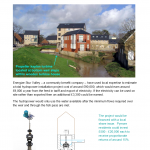 They are particularly suited to high flow low head sites as are common in the Stour catchment because they are efficient over a wide range of flows without the need for a complex control system and fish pass through them undamaged. Protective trash racks can have much wider spacing as they are merely required to protect the turbine from debris. The turbine sits in a concrete trough cast in-situ or a prefabricated steel trough. There is a nice diagram on this website showing the main components: www.ecosolarpotential.co.uk/html/renewables/micro-hydro.html. 1. Is planning permission required? Hydro turbine housings on agricultural land do not require permission. A new structure or alteration within the area around a dwelling (domestic cartilage) may need permission. 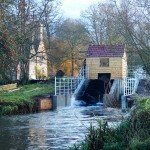 As hydropower is often installed at old mill sites, listed building consent may also be required. 2. What consents are required from the Environment Agency? An Abstraction License is always required. The Environment Agency are entrusted with protecting the ecology and fisheries of our watercourses. They will need to agree the flow through the turbine and the “Hands off flow” needed to protect river ecology. A considerable amount of evidence and a detailed design needs to be presented and site owners usually commission a consultant for the work. An Impoundment License is needed if the up river water level is to be raised. A Flood Risk Consent is required for all works in or adjacent a river to ensure that no disruption is caused during construction. A Fish Pass Consent is usually required. 3. What is the potential for this technology in Dorset? There are many old water mill sites in the country and as long as their original weirs and leats (or millstream) remain in good condition there is potential to install modern hydro generation equipment. The rivers Stour, Frome, Piddle, Lym, Wey and Wicken Stream in Corfe in Dorset alone are all known to have supported water mills in the past. It is a good idea to get involved with other local mill owners and join or set up a support group such as the Stour and Vale Hydro Group and the West Dorset Hydropower Group. If we take Dorset as an example, there are no potential hydropower sites in Dorset capable of generating much more than 100 kW and the majority of sites are smaller than 15 kW. The estimated combined output is in the region of 6,000 – 7,000 MWh/year; enough to power around 1,300 households. Even if all those potential hydropower sites in Dorset were to be developed, they would generate only slightly more than that from a single large (2.3 MW) wind turbine. 4. Do I need to use MCS accredited installers and equipment? No, the government have finally agreed with the majority in the hydropower industry that the Microgeneration Certification Scheme has no benefits for Hydropower and would have slowed the development of the industry. Costs are very site specific, mainly dependent on civil works, and each installation is bespoke. It costs more to get a kW from flow than it does from head. Recent installations have been in the range 3.7 – 20 kW with costs in the range £60,000 – £240,000. A small 3.7 kW scheme is likely to have a value from feed in tariffs, export and saved electricity bills of around £5,000 a year. A more typical 15 kW scheme is likely to have a value of around £16,000 a year. Feed in tariff rates are dependent on turbine size with higher rates for smaller turbine. If you are lucky enough to have a site in or close to the Stour Catchment in Dorset, then you can join the Stour and Vale Hydropower Group to get access to a grant for 50% of the cost of design and achieving the necessary Environment Agency Licenses. There are similar grants throughout the UK. 21.9p per kW for electricity generated under the Feed in Tariff, and 3.2p per kW for electricity exported. 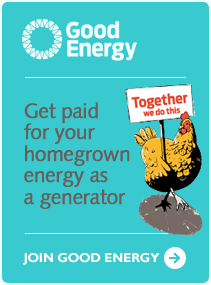 Green energy suppliers Good Energy have their own award-winning schemes to reward customers producing renewable electricity, heat or hot water through wind, water or solar. Hydro-electric power supplies around 20% of the world's electricity! Iceland and Austria produce over 70% of their electricity from hydro plants! The UK has one of the highest wave energy potentials in Europe, if not the world!